There are many videos on Google SketchUp's website that you can view and/or download to help start 3D modeling. 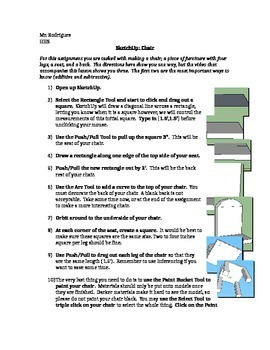 The handout I have here shows one of three ways to create a chair. Students should know how to use additive and subtractive methods of creating 3D models by the end of this assignment, have a good command of line/shape tools and the Push/Pull tool.